We repeatedly tell our clients that regular vacuuming and professional cleaning are the best ways to prevent premature wear of carpets and rugs. Sometimes our clients ask whether there’s such a thing as vacuuming too much. Here are a few pointers to help you keep your carpets and rugs looking great for years to come without inadvertently causing premature damage. Do you have a good air filtration system? The biggest reason carpets and rugs need to be vacuumed is because of dirt and grime tracked in on the bottoms of shoes. The second biggest reason is dust. Ideally, you want to get rid of dust before it settles on your carpets and rugs. You can reduce the amount of dust in your home or workplace with upgrades to your air filtration system, such as air purification, pleated filters, or even an electrostatic filter that is connected to your duct system. If less dust makes its way to your carpets and rugs, you’ll need to vacuum low traffic areas less often. It’s overkill to vacuum delicate carpet and rug fibers in areas that see little activity with a beater brush turned on. On the other hand, it’s ineffectual to vacuum sturdy carpet and rug fibers in very high traffic areas once a week with the beater brush turned off. 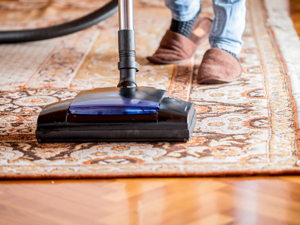 In areas that see little traffic, your goal is to basically remove a thin layer of dust that has settled on the surface, whereas with higher traffic areas, your objective is to remove both surface dust and particles that have made their way deep into the fibers of your carpet or rug. Turn your beater brush off or on, and set the height levels appropriate for your rug material and pile. If you carpet or rug has woven pile, run your hands along the surface to determine which direction the pile naturally points. There will be more friction created as your hand runs against the grain. If you are using a beater brush, vacuum with the pile direction or from left to right across the pile direction, but do not force it against the pile direction, because this may cause premature damage to the fibers of your carpet or rug. If you have a big, powerful, unwieldy vacuum cleaner, try using a carpet sweeper for quick and easy clean up. Carpet sweepers and dusters work much like a broom, removing surface dust, dirt, crumbs, and pet hair. Although they can never replace true vacuuming, they can certainly help keep your carpet clean between regular vacuuming with very little potential for carpet or rug fiber damage.